Sarah is in that stage of loving things soft and chewable. I was able to get the adorable Tobias the Tiger blanket. Tobias, is super cute with a soft face and silky back it was the perfect blanket for Sarah. Everything Happy is the brand of the blanket, which the name fits perfect because Sarah is very happy. At Everything Happy you can choose all types of friendly animals for your child, like a bear, dog, cat, frog and that is just to name a few. Along with the adorable blankets they also carry plush's which match the blankets. How cute! You can also purchase gift sets, and pillows to complete your Everything Happy collection. Happy Blankets are $28, Happy Pillows are $38 and huge! Happy Pals are $8 and super cute, small so they fit in a diaper bag, or stroller. Happy Threads are cute onesies and tees to complete the child with the look of their Happy Set. The onesies are $18 and Tees are $20. What also sets Everything Happy apart from the rest is that everything is Unisex so you can't go wrong on gifting these adorable products. Gift sets for a perfect baby shower are $50 which come with a Happy Blanket, Happy Pal and Onesie! Which all makes a great start for the complete set for baby! Sarah Loves her Happy Blanket its her sleep blanket every night. And that makes her Everything Happy. Disclosure: I was given a Happy Blanket Tiger to help with my review. All opinions are 100% mine. I love Wiggle the hippo. I like Chase the Dog. My favorite is the Love Happy blankie. My son wold love Chomp the Dinosaur! Thanks so much for the fantastic giveaway! 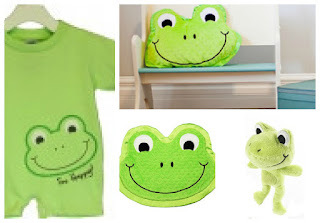 My favorite is Stomp the Frog Happy Pal. 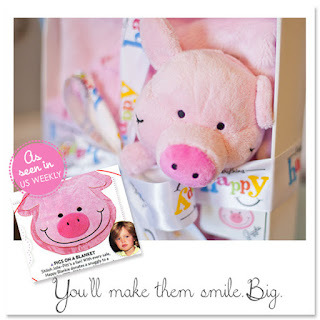 Giggle the pig is so cute!!! i love giggle the pig! I love Giggle the Pig!! Chomp the Dinosaur is my favorite. My favorite is Chase the Dog. stomp the frog is my favorite. flip the monkey. tonight my son asked me to go to walmart and buy him a monkey! maybe this would suffice. I really love the Garfield Happy Blanket. I LOVE Tumble the Bear. 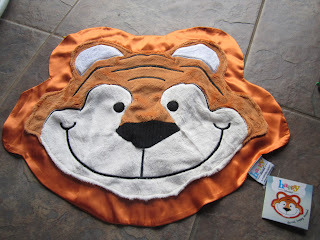 I like Tobias the Tiger. I really like Rumble the Elephant. Flip the Monkey is my favorite.